We offer 1 Loop Fire Life Safety Small Analog Systems. Comes standard with one loop that supports up to 64 intelligent devices of any type and two Class B NACs. Supports up to eight serial annunciators, (LCD, LED-only, and graphic interface). GE Intelligent Smoke Detector are meticulously engineered to deliver high-performance features, superb reliability, and unbeatable quality. With their highly stable design, these detectors resist air movement caused by heating and air conditioning, making them reliable performers ideally suited to modern building interiors. The installation and maintenance advantages of Vigilant brand intelligent detectors add value throughout their service life. The twist-and-lock design makes short work of installation and maintenance operations. A plastic breakout on the detector housing optional vents removal from the base except with a special tool. A bright, easy-to-see LED fl ashes red when the detector is in alarm,thus eliminating much of the guesswork when responding to front-panel indications. The V-HFD is fixed-temperature heat detector with an alarm threshold of 135° F (57° C). The V-HRD is a rate-of-rise heat detector calibrated for 15°F(8°C) per minute. The V-PHS houses an optical sensing chamber that detects smoke, as well as a fixed-temperature sensor that detects heat. 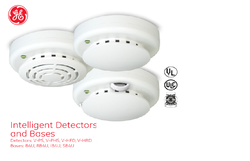 The detector analyzes data from both sensors to determine when an alarm is initiated. The V-PS houses an optical sensing chamber that detects smoke. All detectors feature comprehensive self-diagnostic capability. V-P Sand V-PHS optical detectors continuously adjust their sensitivity to compensate for changes in the environment such as the presence of dirt, smoke, temperature, and humidity. These detectors issue a dirty sensor warning when they reach their preset limit. 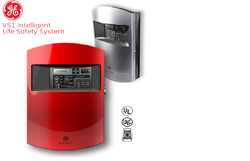 Looking for Addressable Fire System GE ?